If you've been following me for awhile, you'll remember I had a green M&M antenna topper for a long time. A couple years ago, however, it vanished. I have a very real suspicion someone, of the people coming to the temp agency upstairs from the old office, liked it too well. Occasionally, I would think to do an online search of antenna toppers but have never found anything remotely interesting, which would fit my personality. And then I went to Disneyland. 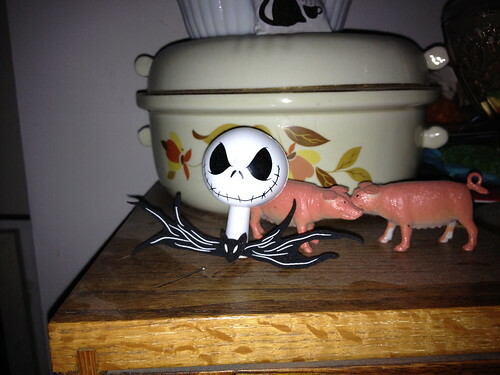 Jack Skellington. I should have taken a photo of the bin. There must have been a couple dozen of these staring up at you near the cash register. It was quite amusing. 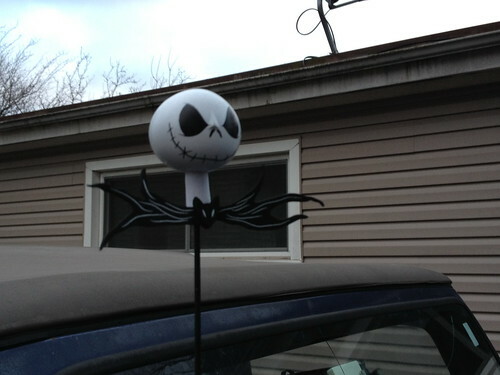 Because this is unique, I have waited until we officially moved to our new offices before affixing it to my antenna. Today was the day. It's almost like he's saying, "Yes, I see you changing lanes without looking or using your turn signal. That foot I found in the lake is going in YOUR stocking."